camera motion is significantly alleviated since the underlying homography transform from each frame to the field domain can be accurately estimated. We use contextual trajectory information (intra-trajectory and inter-trajectory context) to further improve the prediction of object states within an particle filter framework. Here, intra-trajectory contextual information is based on history tracking results in the field domain, while inter-trajectory contextual information is extracted from a compiled trajectory dataset based on tracks computed from videos depicting the same sport. 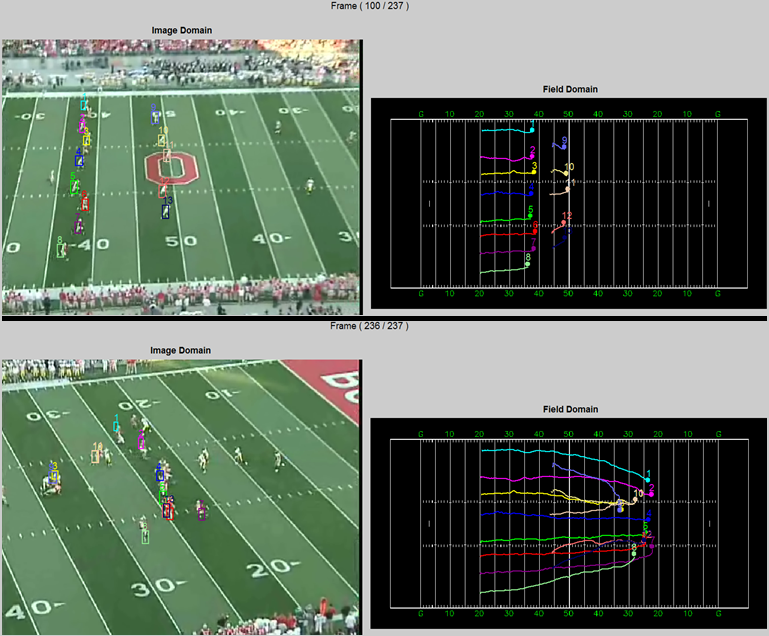 Experimental results on real world sports data show that our system is able to effectively and robustly track a variable number of targets regardless of background clutter, camera motion and frequent mutual occlusion between targets.